Do you ever have those times when you are out shopping and see something you just have to have, furniture wise? It might not match anything in your house but the piece is just too cute to pass up and you'll find something for it to go with? 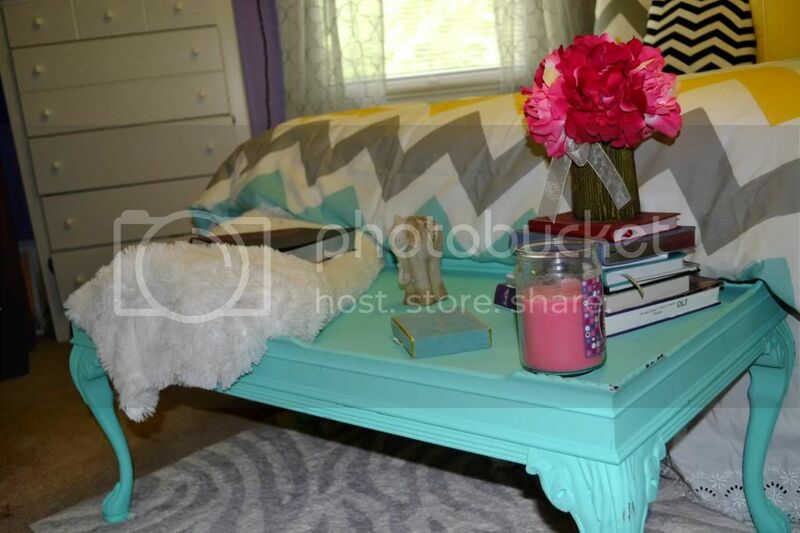 Well I had that happen about 2 months ago when I stumbled upon this turquoise table at a consignment store when my mom and I were out shopping one Saturday. 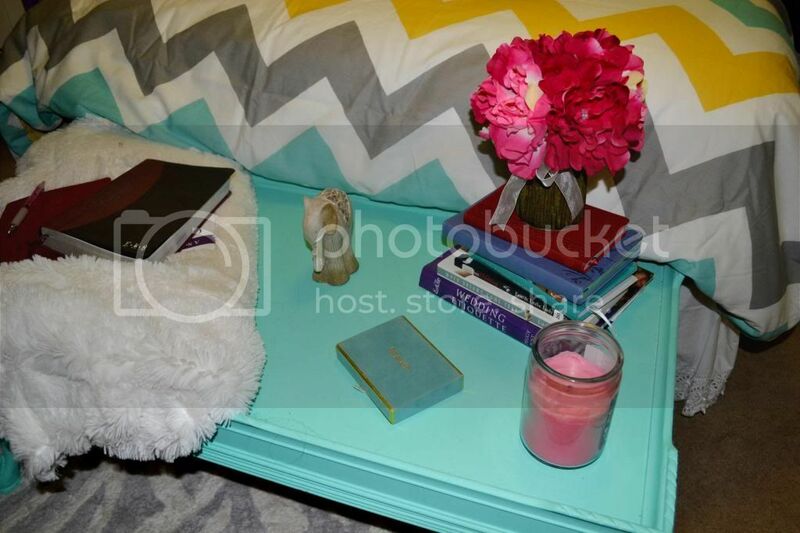 The coffee table was $40...what a steal! I just couldn't pass it up. Mom loved it just as much as I did and I knew it would be so cute in mine and Josh's new place we when got married....wherever or whatever that new place would be. So I bought it, loaded it in the car and brought it home. I didn't really know what to do with it when I got it home but I decided to put it at the foot of my bed for the time being. 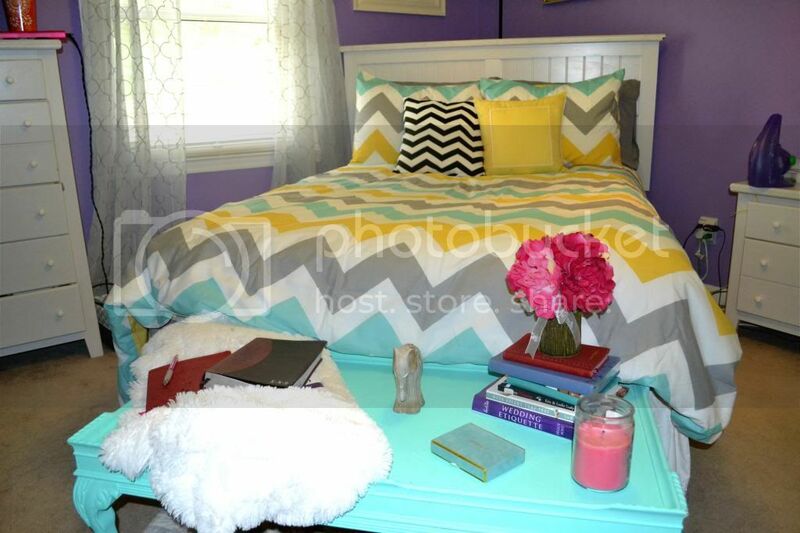 At the time I had a white and grey striped duvet on my bed and the table looked so precious! 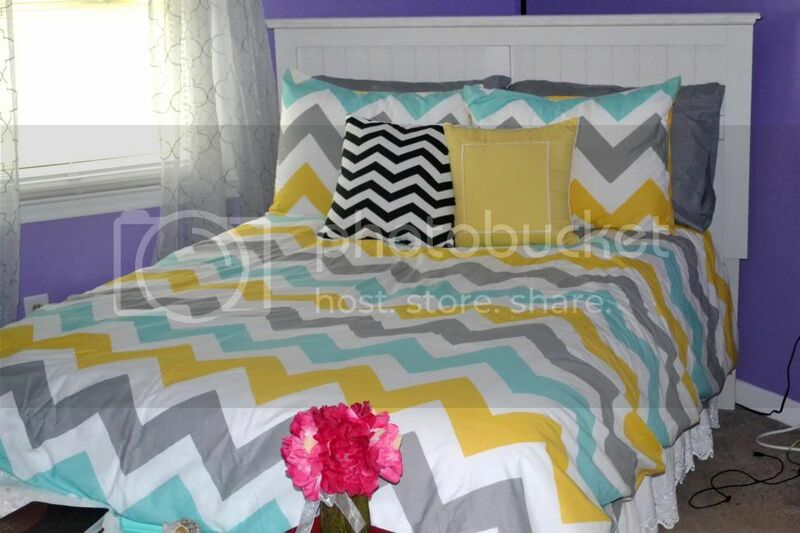 When mom and I went to Charleston a few weekends ago she was looking through the Sunday sales paper as we were driving down and saw that Target had this adorable chevron duvet on sale and it's colors were gray, white, yellow and a blue that looked very similar to the table. 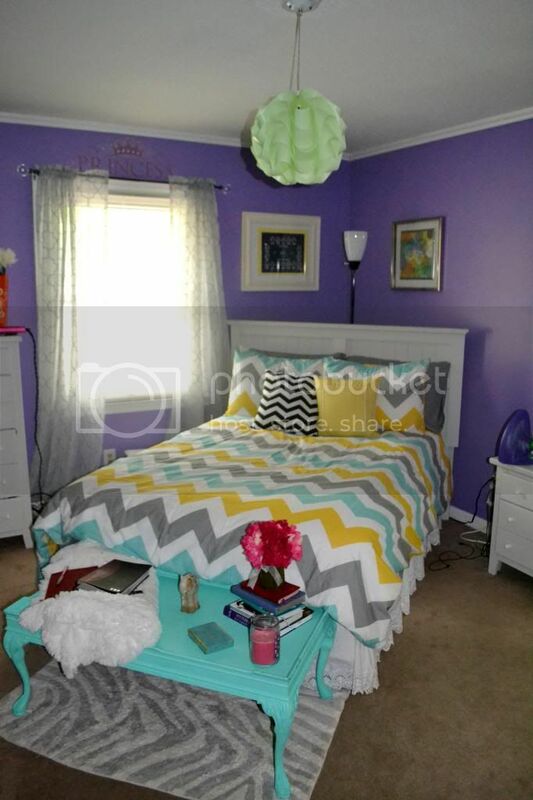 Well a little back story, last summer when I bought the striped bedspread, it was because I had spent MONTHS looking for a white and gray chevron one and just couldn't find it anywhere. So I settled on the stripes and really ended up liking it. When mom showed me this chevron one I just knew I had to have it. Well about a week went by and I thought to myself, I'm about to be moving, my bedspread now is pretty and fairly new, do I really need a new one? Mom had a gift card to Target and shockingly enough, she rarely ever shops there so she gave it to me and told me to go get the bedspread. 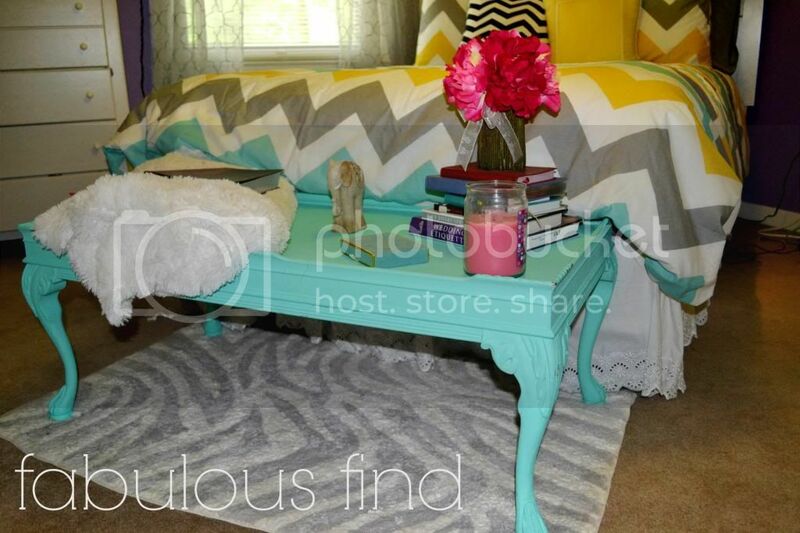 So I did and when I got it home and on my bed, it was the EXACT blue that my table was. Mom got home and freaked out over how cute it was and demanded that the table had to stay when I moved because she was going to paint my room yellow and "just how cute would that be". I mean, I had to agree with her but no way is that table staying, it's way too cute for me to leave behind, haha! A little side note, when I took a picture of the table and sent it to Josh before I bought it he replied with "my poor manhood, being taken away" haha. So point of this post, don't you love it when you get lucky with a purchase and a room comes together better than you could have expected? I hope that this kind of thing takes places many times in the very near future as Josh and I begin to create a home together! I can't wait to see where this little gem ends up in the Colvin house! 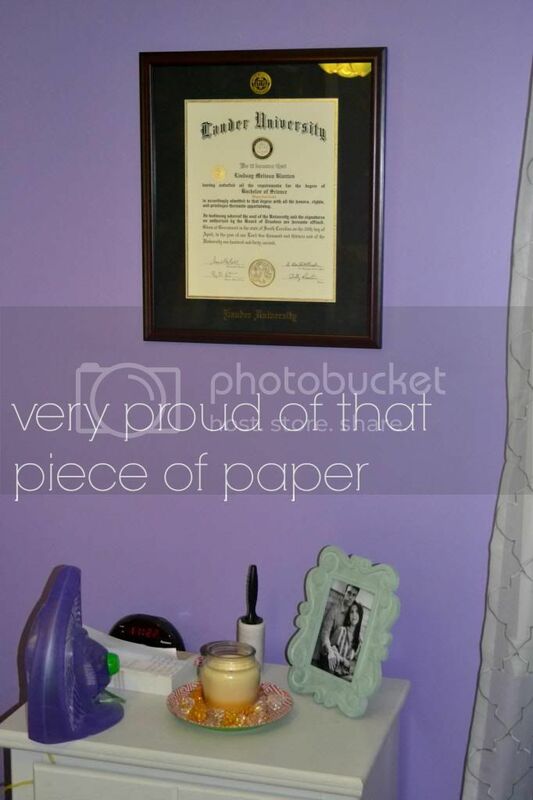 My diploma came in the mail this week and I promptly displayed it in my room until I take it to my office!